Activities are important to keep track of your business communications including logging Calls with customers, organizing Tasks, scheduling Meetings and any other important To Dos. In ZipperAgent you will be working with three types of Activities – Task, Call and Meeting. You can see all your Activities on your ZipperAgent calendar. 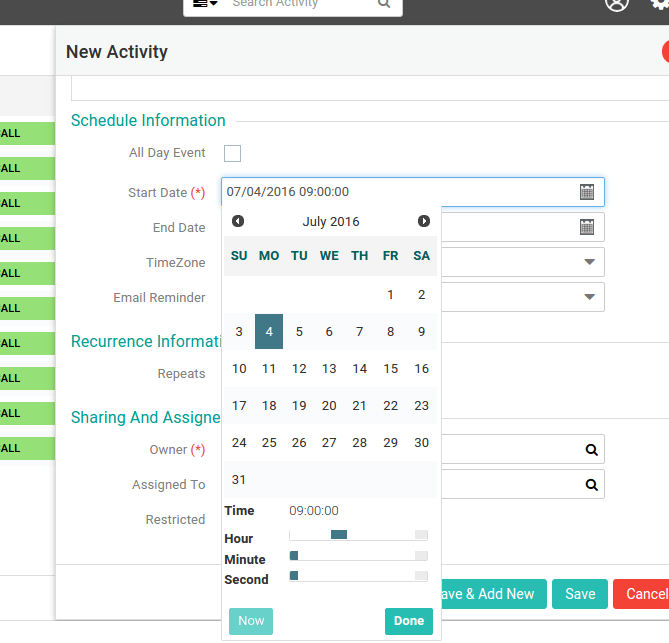 You can create an Activity from the Calendar or directly from the Activity module or from the Contacts and Opportunity detail page. You can relate an Activity to any ZipperAgent record like Contacts, Opportunities or Properties. You can invite other ZipperAgent Users or any Contacts from your ZipperAgent contacts list when creating an Activity. You may choose not to share an Activity with others by marking it Restricted. This will make the Activity visible only to you and admin. You can also set an Activity as public, so that other ZipperAgent users can see the Activity. By default an Activity is created with public access. ZipperAgent also allows you can to integrate your Google Calendar or Microsoft Exchange calendars with ZipperAgent calendar. You can see all your Activities scheduled in the external calendars inside ZipperAgent Calendar, but you cannot schedule an activity locally in ZipperAgent Calendar and see that on your external calendars. 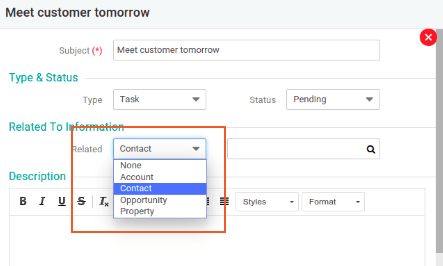 From More actions of Contact/Opportunity/Property/Account – While on a detail page of any of the records, click on “More..” button to see associated information of that record. Click on Activity tab on right side and create a new activity. Activities created from here are automatically linked with that record. From Calendar – Navigate to Activities –> Calendar from top menu from any page in ZipperAgent. Click on any day-cell of the calendar to create a new activity on that day. Subject: This is a mandatory field. Provide a meaningful subject for your Activity. Activity Type - Activity can be of type Task, Call or Meeting. If Activity type Call is chosen, a “Call Type” dropdown appears. You can choose the call type to be Inbound/Outbound/Scheduled-inbound/Scheduled-outbound. If activity type Meeting is chosen, a “Meeting Type” dropdown appears. You can choose relevant meeting type (Regular/Showing). Date fields - Activity start and end dates are defaulted to current system date or if created from Calendar it takes the date of the day-cell on which Activity is getting created. 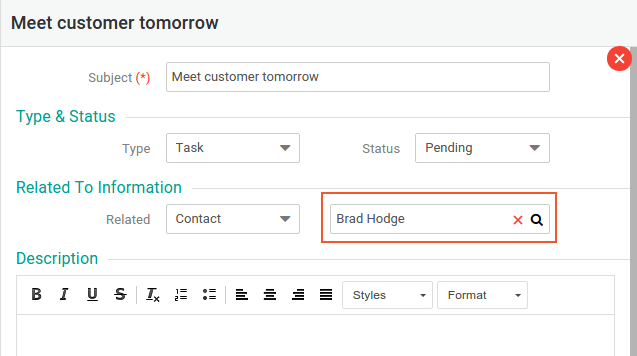 You can change the dates by clicking on the date fields. A calendar will appear, select the event date and time from the calendar. Relate Activity - To link an Activity to a ZipperAgent record click on the “Related” dropdown and select the type of record you want the activity to get linked. Now, click on the adjacent box to select a particular item of the related record type selected. A lookup opens listing available items in ZipperAgent. You can select the desired item from the list. The linked Activity will be displayed on the related tab of the linked record. Remove Related - You can remove a linked/related record by clicking on the red cross (X) beside the record name. Recurring Activity - You can click on the “Repeats” checkbox to make the Activity recurring over a fixed period of time. Select “Repeat Type” (Daily/Weekly/Monthly), Interval and then specify the number of Occurrences. Restricted Activity – By default all your Activities are visible to all ZipperAgent Users. If you want to restrict access to an Activity, click on the “Restricted” checkbox under the “Sharing and Assigned To” section. 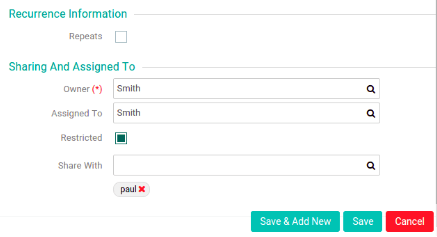 Shared Activity - You can share a restricted Activity to any ZipperAgent users by selecting the user names from the “Share With” textbox. Adding Invitees (for Calls/Meetings) – While creating a Call or Meeting Activity, you can invite one or more ZipperAgent Users or Contacts. Click on the “Invitee Type” dropdown to select the type of invitee (User or Contact). Now on the adjacent textbox start typing the name of the record. ZipperAgent will display a matching list of records as you type, click on the records you would like to invite. Removing Invitees (for Calls/Meetings) - You can remove an invitee by clicking on the red cross button beside the invitee name. Save Activity – Save an Activity by clicking on the “Save” button. In case you want to add another activity, click on “Save & Add New” button. Cancel Activity - Click on “Cancel” button if you do not want to save the Activity. 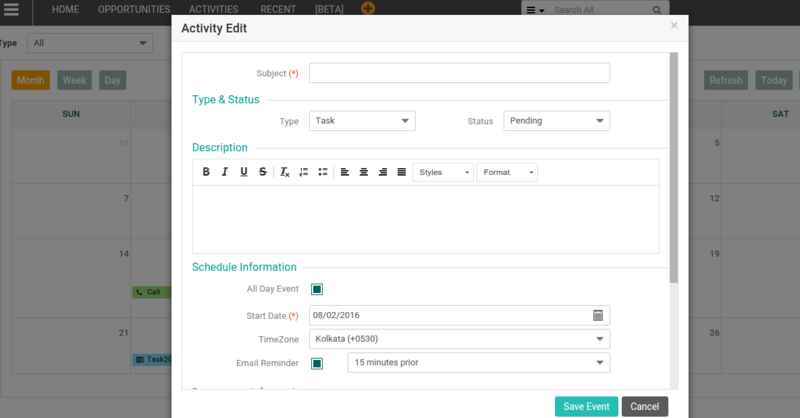 While on Calendar, click on any event, it will open details of the Activity in edit mode. While on Activity List Page, click on the Activity sequence number adjacent to subject. While on Calendar, click on an cell event. While on related details of any ZipperAgent record, click on the Activity subject link You can edit an activity from various places. While on Activity detail view, click on “Edit” button.